The ThirdEye project supports farmers in Kenya by setting up a network of flying sensors operators. These operators are equipped with flying sensors and tools to analyse the obtained imagery. 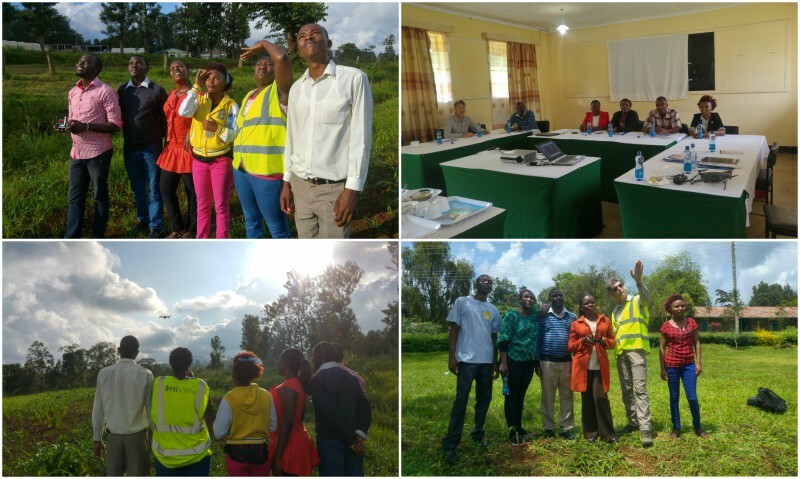 In December ThirdEye staff conducted an intensive two weeks flying sensor training at Agricultural Training Centre (ATC) Kaguru, 15 km south of Meru, Kenya. The training was given by our senior staff member Mr Jan van Til, assisted by ATC’s principal Mr Paul Kiriinya and our local manager Mr. Kiogora Julius. Three young women and two young men from the Meru region, all of them professional extentionists, were promoted “flying sensor operator” at the end of the training, each receiving a ThirdEye certificate. The operators are now fit for the job that consists of conducting flights, processing the images to NDVI crop status maps and giving advise to farmers in the fields with the help of GPS tablets. Our innovation is a major transformation in farmers’ decision making regarding the application of limited resources such as water, seeds, fertilizer and labor. Instead of relying on common-sense management, farmers are now able to take decisions based on facts, resulting in an increase in water productivity. The flying sensor information helps farmers to see when and where they should apply their limited resources. Our flying sensors close the missing link to agronomic information on where to do what and when. From January on the ThirdEye service is being implemented in several Meru sub-counties, where farmers will receive advice on a weekly basis. After a few months the service will be expanded to new regions. In this process ThirdEye Kenya will be slowly transformed from a project into a leading local flying sensor enterprise. ThirdEye operators receiving training in the classroom and in the field.